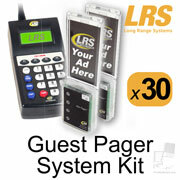 Welcome Healthcare Pager System Shoppers! 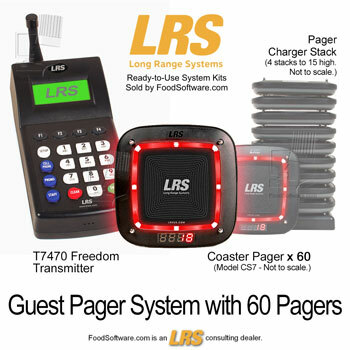 FoodSoftware.com is the largest internet dealer of patient and staff paging systems because we have the lowest prices, most responsive service and fastest shipping available anywhere. 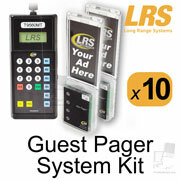 We proudly sell LRS (Long Range Systems) products because LRS has the most innovative, highest quality equipment and best customer service in the market. Who uses these pager systems? Our paging systems, though originally for restaurants (thus our "FoodSoftware" name), are also widely used in hospitals, clinics, nursing homes and many other healthcare applications. The FoodSoftware.com client list includes major hospitals-- Veterans Administration, Kaiser-Permanente and many others-- and numerous specialty clinics: oncology, optometry, imaging and dental to name a few. 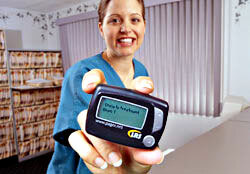 How big and complicated are healthcare pager systems? The beauty of these systems is that they range from extremely small and simple to very large but still relatively simple, and scale to all sizes in between. The smallest system can be just a one-button push-for-service transmitter and a single pager to call someone to a front desk or exam room. A medium-size patient system is just a bunch of restaurant-style pagers that go off when you punch pager numbers into a phone-style number pad on a desk-phone-size transmitter. The largest systems, for calling staff, patients and doctors, work using simple browser-accessed software (like using a web site) that are surprisingly easy to install and use. Low equipment costs and startup costs, with low costs for even our most capable equipment. Easy and minimal setup and training. Reduced or eliminated per-message charges. Eliminate all forms of monthly message fees. Very wide user scaleability, from 1 to 100,000 users. Assurance of message and page delivery and task completion too. Extremely powerful and flexible capabilities with a customizable mix of PC-client/server browser-access software, radio, intranet and internet connectivity, local or global-reach paging and messaging and wide mix of of LRS equipment. No interference with medical equipment. Eliminate overhead or out-loud calling of patients' names to reduce noise and comply with privacy requirements. Eliminate uncomfortable and unsanitary waitroom crowding. Allow patients to wander, to sit with coffee in the cafeteria, or enjoy waiting in an outside garden for a more relaxed experience. Send private text instructions to patients to direct them to a destination or call a number. Use pager devices appropriate for the public rather than staff because they are conspicuous, durable, cleanable, tamper-resistant and customizeable with your graphics and text. Enable patients to be paged using their own cellphones so you can distribute fewer regular pagers and take advantage of the global reach of the cellphone network. Track and alert patients using waitlists accessed on PCs that can be shared and worked from multiple staff stations. Alert or message patients either singly or in groups. Track patient pages to ensure response and automatically repage if need be. Provide coverage to areas where the cellphone network can't reach (especially interior and underground locations). 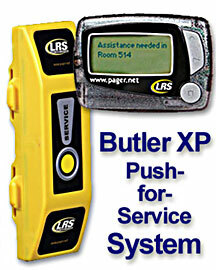 Staff pagers are small and inconspicuous or silent and may be worn or pocketed all day. They can display text messages or be vibrate/beep only for economy. Assure communication success by using any or all available messaging modes with a single message launch to text pagers, cellphone and/or email (and voice messaging to come). Launch pages wherever there is access to PC browsers, from any PC connected to your network-- from offices, reception areas, nursing stations, etc. 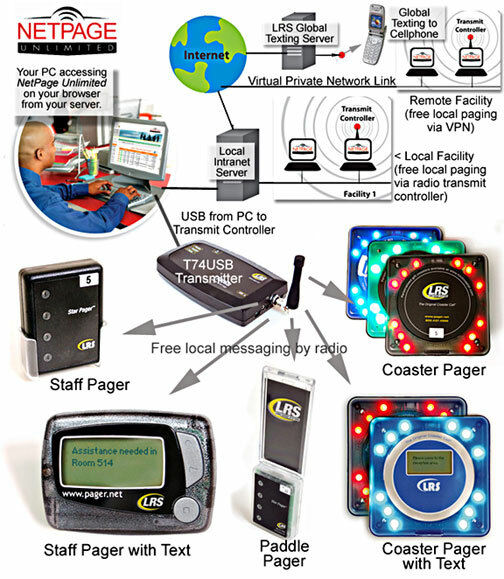 Launch pages from small, independent, inexpensive, wireless battery-powered transmitters. Often, these are units simply mounted on examining room walls to signal a staff member to come to the room when the button is pressed. Conveniently maintain and message staff groups for instant simultaneous paging of group members. Administer, track, record and maintain messages. Maintain and view staff in/out status by web browser. Eliminate or reduce monthly wide-area paging fees by texting to cellphones instead. Eliminate paging fees entirely to all locations within local radio range, including remote locations connected by virtual private network. Eliminate redundant personal devices by using cellphones alone instead of carrying both cellphones and pagers. Provide coverage to facility areas where the wide-area pager and cellphone networks can't reach (especially interior and underground locations). Track page or message response or confirmation and/or task progress to make sure that messages are received or responded to or tasks are completed, especially critical items. Automatically respond to missed pages and task deadlines with additional reminder pages or messages automatically launched by all available means. Assure communication success by using any or all available messaging modes with a single message launch to text pagers, cellphone and/or email (and voice messaging to come), and reaching places that wide-area pager and cellphone networks can't reach (such as interior and underground locations). Eliminate or reduce monthly wide-area paging fees by texting to cellphones instead (per-message charges apply rather than per-month). 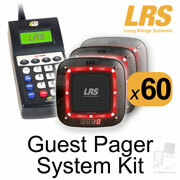 Patient-to-Staff Paging / Push-for-Service Paging: LRS paging systems are widely used in nursing homes where push-for-service transmitters are located in every patient or resident room to call staff to the rooms as needed. The transmitters are ideal for emergency use as they are small, brightly colored (with wide choice of colors), and battery powered so they can be conspicuously (or not) mounted anywhere- to walls, rails, posts, bedside, bathrooms (they're weather and water-resistant) etc. without need for any wiring. The transmitters have a single, obvious "Service" button. The transmitters send user-programmable text messages to selected pagers to identify the caller's location (or send any message). The transmitters can send the same message to multiple pagers simultaneously. The transmitters have an automatic repaging feature to ensure response. If the first page is ignored, the page rolls over to another pager so it can respond instead. These systems are easy and cheap to scale up. The transmitters and pagers are inexpensive and usually require no other equipment to work (no central unit is needed to process signals). Just get more transmitters and pagers as needed. What's a local pager system? "Local wireless pager systems" don't use phone lines because systems have their own radio transmitters that broadcast up to a half mile or so. These can be extremely simple to use: To signal pager #5, punch the "5" button on the transmitter keypad. The pagers are usually silent but hard to ignore because they vibrate or flash strongly. Most of our systems are super easy to install- they're basically plug-and-play. They come complete with pagers, chargers and control transmitters. What Kind of Pager System Do You Need? The main kinds of pager systems are for either staff or patients or both. Staff pagers are for employees who keep them all day, usually clipped to a belt. Staff pagers are small and usually just vibrate silently. Some of our systems also use the internet to page cellphones (staffs' or patients') by either text or voice. 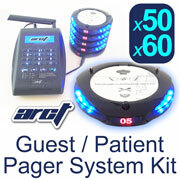 Patient pagers are carried only while they wait to be called and then the pagers may flash or vibrate conspicuously. Patient pagers are usually the size and shape of drink coasters ("restaurant style") so they're hard to ignore. How Many Pagers Do You Need? 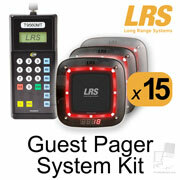 This web site offers systems by the number of pagers in the set: 1, 5, 10, 15, 20, etc. You can conveniently order all the typical systems with this web site's shopping cart. You can also get custom systems in any configuration and number of pagers. To discuss and order custom systems, call 805-375-7000. How Many Transmitters Do You Need? Most patient systems offered here have one transmitter (also called "base stations" or "control panels") but have many pagers. 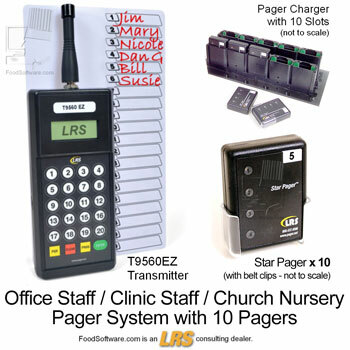 Patient-to-staff systems have the opposite, with many transmitters (one per room) but few pagers (one per staff). For example, nursing homes or clinics may have many transmitters (one in each patient or exam room) but just a few pagers for the staff. These are usually custom systems, so call 805-375-7000 to order. More Powerful and Flexible Systems: Most of the systems described here work by sending radio signals directly from transmitters to pagers. But we also have systems that also do both- use radio transmitters and also do cellphone texting or voice paging via PC network and internet. Our most flexible systems (see NetPage Unlimited) use your PCs with browser-accessed software to send pages and text messages. Pager Range, Range Extension and Networks: The distance that local pager transmitter radio signals reach varies from a mile down to a few hundred feet, depending on the surroundings. Radios love open air and lightweight structures and don't do as well in heavy buildings with lots of concrete and steel (i.e., a typical large hospital building). So, to cover entire large hospitals, we use either repeaters or transmit controllers distributed around buildings or campuses to form networks that extend signal range. If you only need coverage in a waiting room and down the hall, no extra devices are needed. If you want coverage in certain places but not others, just add devices where required. However, our cellphone texting features work everywhere texting normally works because it uses the global cellphone network (which does not use local LRS transmitters or repeaters). The system below is used by small to very large hospitals and heathcare facilities where maximum features, flexibility or range are required. Users, waitlists, pages and messages are initiated from any PC on your local intranet (ethernet connection) via their browsers. 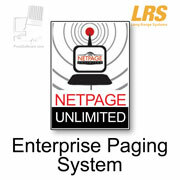 The NetPage Unlimited software is hosted on your local intranet server. One or more of your PCs are connected by USB to a T74USB transmitter which can then wirelessly signal or message any of the staff or patient/guest pagers. 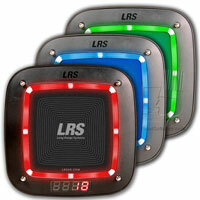 Your internet connection to the LRS texting server sends text messages to cellphones anywhere. Your virtual private network (via internet) connects you to any other remote facility of yours equipped with NetPage Unlimited where it can be paged and messaged the same as your local facility. The below are mostly simple waiting room systems for paging patients back to the reception area. 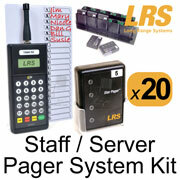 Most of the below are simple staff paging systems for alerting staff with a simple silent page (and no text message). The below are simple staff paging systems for alerting staff with a simple text message. 33 items found searching fields.